Why are we sometimes so afraid of the wrestle? Of the things that don't make sense? Why are we afraid to ask God the hard questions? Why are we afraid to bare our soul before a God who already sees all? For some reason within the Christian faith a myth has been created. The myth that we have to have perfect faith in order to achieve what we ask of Him. That to ask Him the hard questions is somehow disrespectful to God. That we should close our mouths and accept what is happening to us always. Let's go ahead and debunk that myth. A relationship with our Creator is just that, a relationship. He wants us, every bit of us. There is nothing we ever need to hold back from Him. In the scriptures there are many times the people we look at as having "the greatest faith" had doubts of their own. Not only that, they voiced them. Abraham questioned God on the sacrifice of his son. Moses questioned whether he was the right man for the job. The disciples, who were Jesus' right hand men and with Him all the time, questioned Him on the daily. Even Jesus asked God why He was forsaking Him. God is big enough to handle our questions. I want to say this again. God is big enough to handle our questions. I'm sure you've read the story of Jacob and how he wrestled with God until daybreak. Even when Jacob was overpowered he still continued. He refused to let go. What's interesting to me is what happened when the wrestling stopped. Jacob said he had seen God "face to face". In His questions, in his determination, in his wrestling, He saw God face to face. As Jacob allowed his humanity to shine through it was in that moment he saw all he ever needed to know. Not only that but God blessed Jacob. Blessed him. He didn't turn Jacob away for His wrestle. No. He heard his questioning, his longing, and blessed him in spite of his human frailties. That is a big God. We don't have to act like we have it all together. if God sees and knows what's in our hearts (He searches them) why would ever try to hide our hearts from Him? When we are in relationship with someone, the only way to go deeper is to give them every bit of you. That's what He asks for. Questions and all. 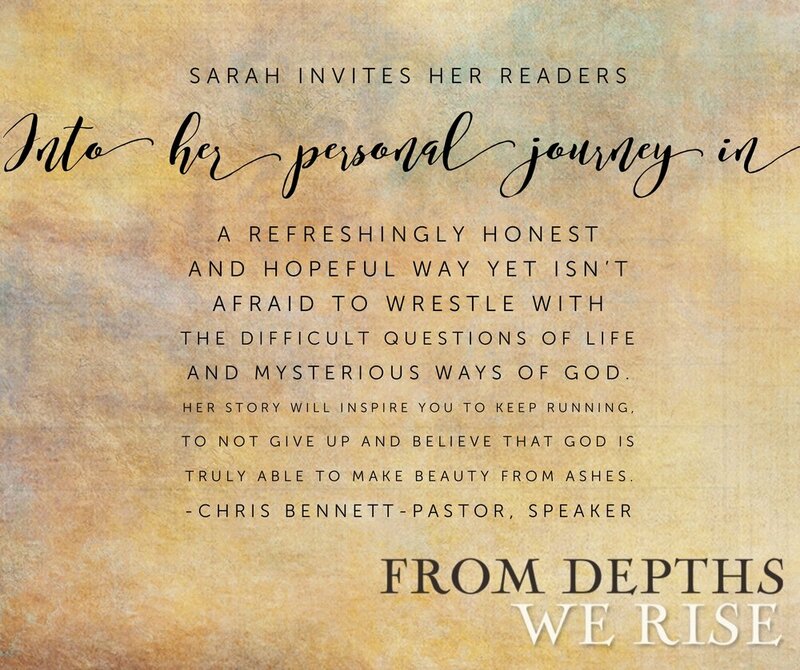 In my new book From Depths We Rise, you will hear a story with a good dose of my own wrestle. After the loss of Joel questions abounded, but when Ellis became sick my heart questioned like never before. I questioned His purposes and His ways in a constant loop. I wept as I cried out with my feelings of forsakenness. I asked Him where He was, over and over and over again. At one point I nearly walked away from Him. In the book I came to a conclusion, that changed my life forever. I would have never come to that place had it not been for my wrestle, the moments I bared my soul to the one who sees it anyway. In that place I saw Him.....face to face....and my life was never the same again. **From Depths We Rise releases in just 9 days! The book is currently on Amazon for only $9.45.